Aaron Basha's Baby Shoe collection features this festive saddle shoe charm. It is fashioned in 18kt white gold with an 18kt yellow gold saddle for a beautiful two-toned look. Striking white diamonds embellish the saddle, and a single solitaire rests at the knot of the shoestring tie. 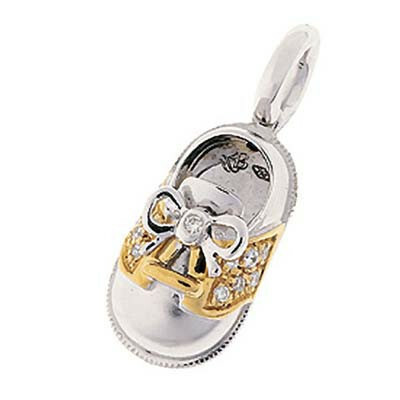 For the baby with the platinum smile, this Aaron Basha charm is a perfect representation!